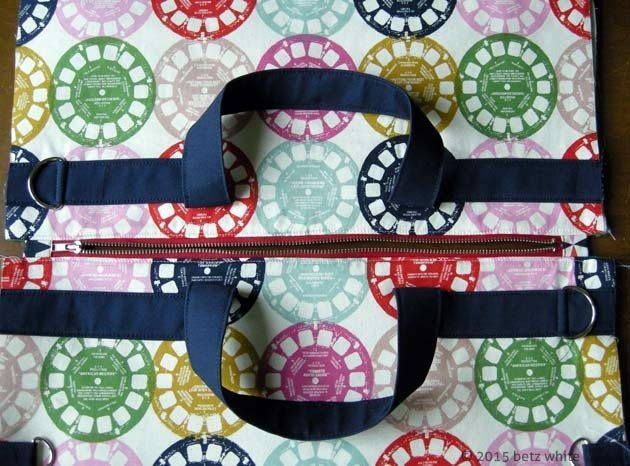 We are cruisin’ right along with our Field Study Tote Sew-along! Today is all about the zipper! I chose a nice red zipper to give my bag a fun pop to go along with the playful print I’m using. 1) Make a few hand stitches at the top of the zipper tape (like we did on Day 2 for the interior zippered pocket) to keep them even and aligned when installing the zipper. 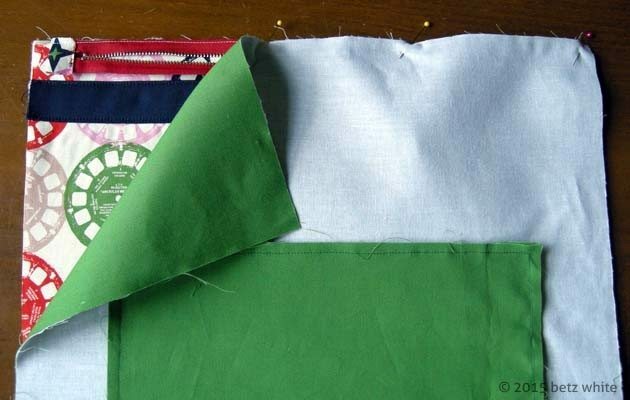 2) Fold a Zipper Tab piece in half crosswise, wrong sides together, and press to create a crease. Open the fold, then fold the raw edges into the center crease and press. Refold the so that the raw edges are all enclosed. Repeat for the second Zipper Tab. 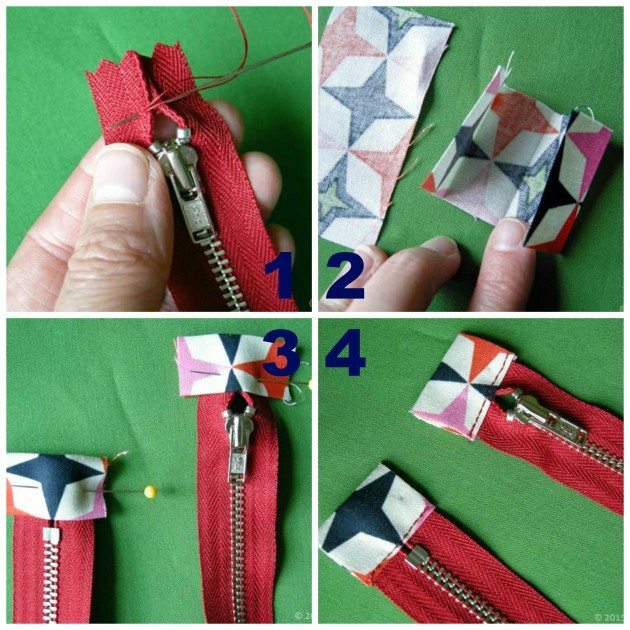 3) Place a Zipper Tab onto one end of the zipper, sandwiching the zipper tape between layers with metal pieces of the zipper exposed. 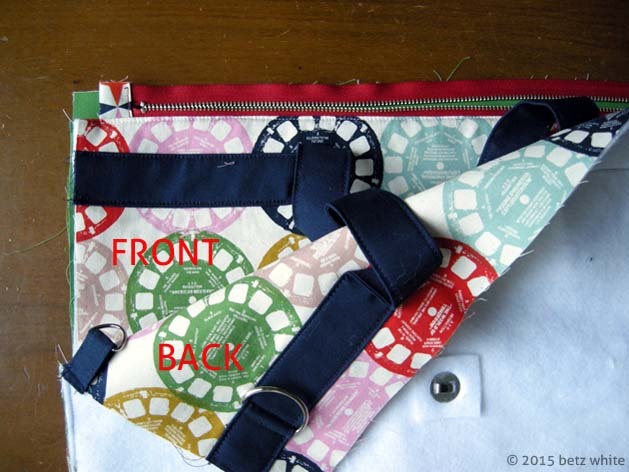 Pin, then sew across the Zipper Tab 1/8” from the folded edges. Repeat with the second Zipper Tab at the other end of the zipper. 4) Trim the tabs to the width of the zipper. The total zipper length including tabs should be approximately 16”. With the Bag Front facing right side up, fold down the handle and pin it out of the way. 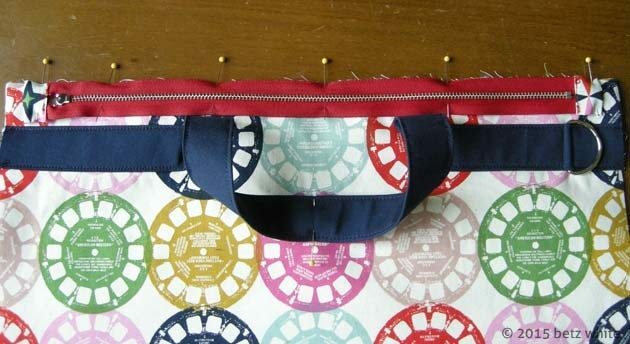 Place the zipper right side down along the top edge of the Bag Front, centered side to side. There should be at least 3/8” space on either end of the zipper. Machine baste the zipper in place 1/8” from the edge. Layer and pin the Front Lining right side down, on top, sandwiching the zipper and aligning the top edges. Using a zipper foot on your sewing machine, stitch together 1/4” away from the edge, through all layers including the zipper tabs. Next fold the Front Lining and Bag Front away from the zipper, matching their wrong sides together, and press. Topstitch along the Bag Front through all layers, 1/8” from the seam. Pin, sew, press and topstitch as before. Later this week we’ll finish assembling the lining, exterior and add boxed corners.